Pat Mitchell, CEO of The Carpenter Health Network, was named the 2019 Public Citizen of the Year by the National Association of Social Workers, Louisiana Chapter (NASW-LA). 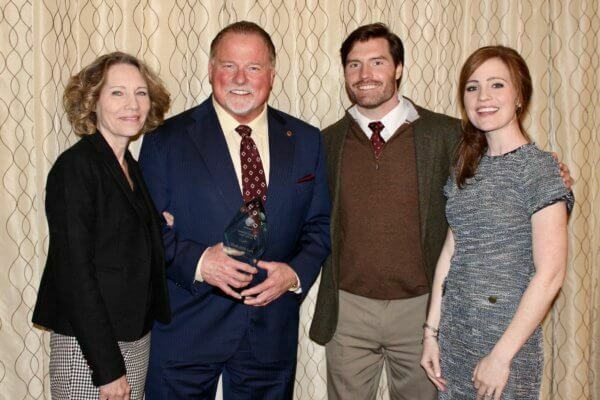 Mitchell was honored at the NASW-LA Annual Conference, held at the Baton Rouge Hilton on March 20, 2019. The award recognizes an outstanding member of the community who is not a social worker, but whose accomplishments personify the values and ethics of professional social work. The individual must also have made substantial contributions to an area or population of concern to social work such as at-risk or vulnerable populations, quality of life, and social issues. NASW-LA Vice-President, Edgar Guedry, LCSW presented the award to Mitchell. He described Mitchell as both a visionary and pioneer in healthcare and community services. Over the past 25 years, Mitchell’s core value has been to ensure a person’s comfort and dignity take precedence at every level of care. Working with leaders and healthcare providers in communities across Louisiana, and neighboring states, Mitchell established a continuum of post-acute care services for adults and seniors. Mitchell was also recognized for his efforts to improve not only healthcare services, but also access to care. He has funded research to better understand what services minorities are not receiving and implemented methods to eliminate barriers. Mitchell played a vital role in establishing the Women’s New Life Center in Baton Rouge, LA. The center offers a safe and supportive environment for adolescents and women faced with the physical, emotional and spiritual challenges of an unplanned and/or terminated pregnancy. Mitchell has aided innumerable local communities and individuals, quietly and often anonymously. Whether reaching out following natural disasters, family tragedies or supporting young people in furthering their education, Mitchell is a compassionate person who seeks to serve others in their time of greatest need. Mitchell, pictured with his family, also gave tribute to his wife, son, and daughter who attended the awards celebration. Based in Baton Rouge, Louisiana, The Carpenter Health Network serves six southeastern states, providing a continuum of care that meets patients’ changing needs over time through nursing, rehabilitation, home health, medical house calls, hospice and more. For more information, call 225-769-4674 or visit TheCarpenterHealthNetwork.com. NASW-LA is a statewide chapter of a National Association of Social Workers, the world’s largest membership organization of professional social workers, with more than 120,000 members. NASW-LA works to promote, protect, and advance the practice of social work for Louisiana’s 8,000+ social workers while also advocating for the enhanced well-being of individuals, families, and communities throughout Louisiana.